Malysiak DR, Tollefson T, Koutsos E, Edwards MS. 2013. Routine dietary husbandry influences sensory evaluation in leopard tortoises (Stigomochelys pardalis). In Ward A, Coslik A, Mahan K, Treiber K, Reppert A, Maslanka M, Eds. Proceedings of the Tenth Conference on Zoo and Wildlife Nutrition, AZA Nutrition Advisory Group, Salt Lake City, UT. Controlled sensory evaluations objectively assess physical and/or chemical characteristics that may influence food preference. Such evaluations are valuable to determine food properties that may encourage, or discourage food intake. Multiple factors influence animal behavior and subsequent choice. These must be strictly controlled so specific treatments can be considered in relative isolation. Six, subadult female leopard tortoises (Stigmochelys pardalis) participated in paired comparison tests of two manufactured forms of a nutritionally complete, herbivorous tortoise diet. To provide a neutral environment distinctly different from the animal enclosures, sensory assessments were conducted in a 189.3 L structural foam stock tank (Model 4243, Rubbermaid® Commercial Products) oriented to the sun in the same direction as animal enclosures. A supplemental heat pad (Model FH-RS2B40, Osborne Stanfield®) maintained at 25-35°C was beneath the stock tank at all times. Separate food dishes of equal size (13.97 cm diameter) and color were placed adjacent to one another at one end of the tank. At the opposite tank end, a single point was designated equidistance between the tank sides. At the beginning of each session, the test animal was placed in the arena with their head directly above this reference point. In a balanced Latin square design, two diet x orientation (i.e., left and right positions) combinations were randomly presented to each animal on three separate occasions for a total of six observations per animal. In random order, each animal participated in one session daily. Study subjects were not offered their regular diet on the day of evaluation. Each individual animal was allowed 10 min to participate. During each session, first diet/location selected and number of changes between diets (locations), were measured. A session was concluded at the end of 10 min or once 100% of one diet was consumed, whichever occurred first. Data were analyzed using ANOVA with significance at P < 0.05. Both diets were palatable to the subjects. The difference of intake between the two foods was not significant (P = 0.1244). However, there was a significant effect of orientation (P < 0.001) with the left position being preferred regardless of diet in that position. Animals participating in this evaluation are part of an individually housed and similarly maintained research group. 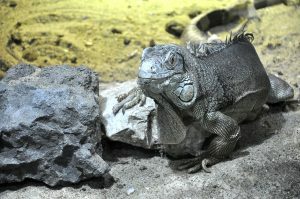 To minimize potential influences across the group, orientation of elements within each animal’s enclosure, including food dishes was consistent. Based on typical animal location at the routine feeding time (0900h), the designated food dish location is to the animal’s left. The significant preference for the left position observed here may be an unintended result of this standardized routine management. The influence of prior animal experience should be considered when interpreting results of sensory evaluations.